Israel 'seriously damaged' Syria's air defense system, IAF Chief of Staff says. Residents of the Golan Heights awoke on Saturday to air raid sirens after an Iranian drone entered Israeli airspace from Palmyra, Syria. The drone was shot down, and the IAF retaliated by striking Iranian targets in Syria. However, the Syrian army fired Russian-made surface-to-air missiles at the IAF's F-16I "Sufa" fighter jet, which the IAF confirmed as downed. The plane's pilots ejected, but both sustained injuries. An IDF investigation showed that just before 4:00a.m. Saturday, the IAF identified an unmanned Iranian aircraft infiltrating into Israeli airspace. The aircraft remained in Israeli airspace for a minute and a half before being shot down. In response, four IAF F-16I attacked the drone's control center deep in Syria. While they were operating, Syria fired dozens of surface-to-air missiles, and one of them hit an F-16, causing the pilot and navigator to eject once they reached Israeli territory. One of them suffered severe injuries, and the other was injured lightly. 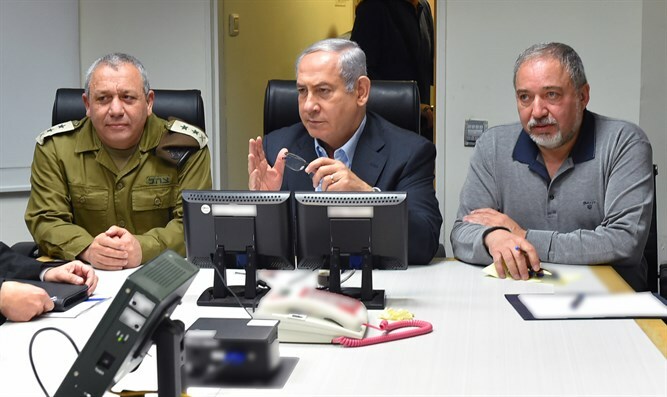 The situation calmed down later on Saturday, and Israel's top security officials are closely following the events. IAF Chief of Staff Tomer Bar on Saturday afternoon said, "The Iranian drone was a very advanced model. It remained in Israeli air space for a minute and a half." "This is the first time one of our planes has been hit by enemy fire since 1983. "The Syrians have a lot of nerve to fire missiles at us, and we therefore operated in a very wide-scale and comprehensive fashion. The IDF response constitutes a severe blow to the Syrian air force's defenses. We hit their fire control center, communications systems, and Iran's listening centers." Regarding the pilots' ejection from the planes, Bar said, "The pilots had just attacked the control center which had operated the Iranian drone sent into Israel. We are examining whether the pilots' injuries are from the missile or from the ejection. It's not clear whether the missile hit the plane, but we estimate that it did. The missiles were fired by Syria, and no one else." "The pilots did not report that they had been injured, but followed ejection procedures. They were rescued quickly and we are investigating what happened there. We will also check how the plane's defense systems operated."